Today we’re going to talk about learning intervals by ear – how to do it, but especially why it’s such a useful skill. Learning intervals by ear: What are intervals? First of all, what are intervals? An interval is simply the distance between two notes. If you play a C-D, that distance is a 2nd (2 notes). If you play a C-E, that distance is a 3rd (3 notes). And so on. Intervals can be played separately (melodic) or together (harmonic) – they mean the same thing either way. So why is learning intervals by ear important? There are so many reasons. Firstly, they are the main building blocks of melody. If I play a simple melody on the piano, the entire melody is comprised of a variety of intervals. So if my ear can tell what’s a second, what’s a third, and so on – instantly, with minimal conscious effort – then I should be able to mimic a melody easily. I’ll show you what I mean. I have Teoria open right now (a website I recommend for interval training, since it’s really easy to use and customize), and I’m going to get it to randomly generate a melody. Then, I’m going to play back the melody by ear. I don’t have any music in front of me, so this is done entirely by ear. When I do this, I’m not consciously thinking of each individual interval – anymore. When I first started ear training way back in the day, I would have put much more thought into it. But the point is to develop your ability to discern intervals so that it’s second nature. The main reason we do this, as mentioned earlier, is so that we can easily pick out melodies. Another example of picking out a melody might be if you hear a song on the radio that you like. Maybe you’d really like to figure out that tune on the piano. If interval training is instinctual to you, this is an easy process. The main reason I wanted to hear a bit of the tune is to make sure I’m starting on the right note. Sometimes if you pull a tune right out of your head, you’ll end up playing it in a different key than it was written. It’s not a big deal, but if you’re going to try to sing it or play it with others, that’ll cause some problems. So listening through a bit of the melody, I can press a few keys to figure out my starting point. Then, with the tune firmly entrenched in my head, I could go ahead and play the entire melody if I wanted. Are you starting to see how useful this is? I don’t have any sheet music in front of me. But with a knowledge of the song and a strong foundation in intervals, I can play the entire melody on my first try, with only a few slips. So the main benefit of doing interval training is to be able to play melodies by ear. But aside from building the skill of playing melodies on the piano, learning intervals will help you sing better, too! Having a really good sense of the distance between notes is what enables singers to carry a tune without any instruments. Most people who haven’t really developed their singing or ear skills can’t maintain a melody all on their own. If even one or two intervals are botched (maybe your voice doesn’t jump high enough in a part), you’ll end up accidentally changing keys while you sing. And you probably won’t notice! If you understand intervals well enough that you can mimic a melody on the piano, then by default you’re training yourself to be able to do the same thing vocally. In fact, some people find interval training with vocals is easier than piano! 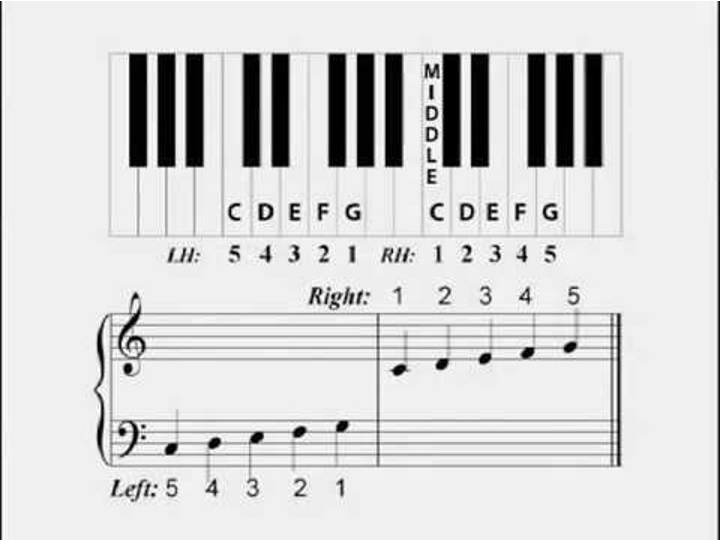 So learning how to tell a 2nd apart from a 3rd, apart from a 4th, and being able to tell a major 3rd from a minor 3rd, or a 5th from a diminished 5th, are the teeny tiny building blocks of being able to easily imitate a melody by ear. Interval training is the single most important component of playing a melody by ear. So how do you learn intervals? My philosophy is to start interval training in the first year or two of lessons – children and adults alike. 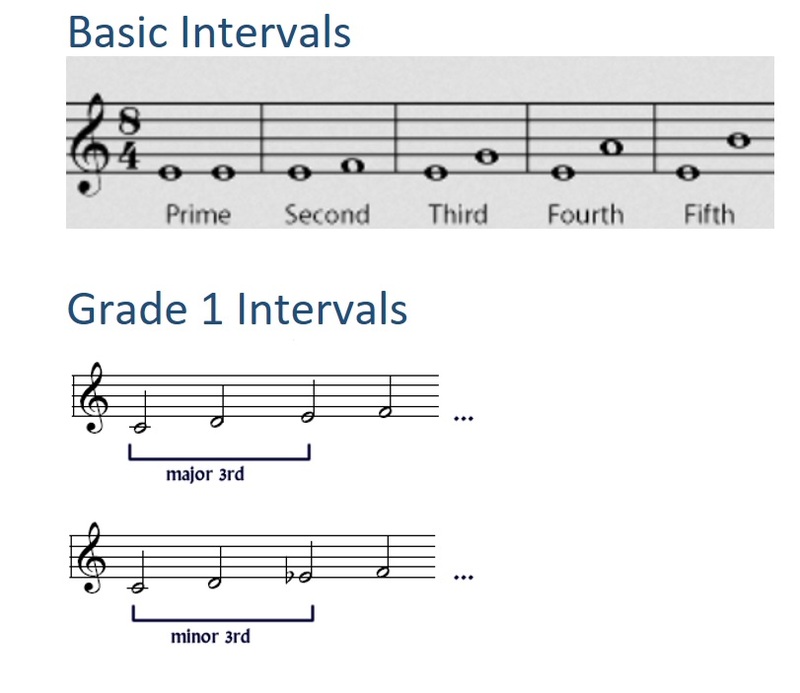 If you do RCM exams, identifying intervals (albeit just a couple) is required right from grade 1. The ABRSM is a little different, but you’re required to imitate a melody right from grade 1, which interval training can help with. With in-person studio lessons, we set aside 5 minutes ideally every lesson (but more like 2 weeks a month if we’re busy) to work on ear training, which often involves identifying intervals. Like anything, I find that repetition and practice is the key to success. In the first couple years, we’ll start simple – just 2nds, 3rds, 4ths and 5ths. By the time the student is finished “musical kindergarten” and is at a grade 1 level, we incorporate major and minor 3rds. By the time they reach around a grade 8 level (RCM or ABRSM), we’ll have done all intervals – everything up to an 8th (octave), and all of the major/minor/diminished/augmented variations. How long does it take to learn intervals? As you can see, it’s usually a very slow process. The typical 7 year old beginner can expect to be pretty good at interval training by the time they’re 17. If they have a knack for it, or spend additional time training their ear (like learning to play music by ear), then they can expect to be excellent at it. What about the adult student, then, who doesn’t want to wait 10 years to master this musical skill? I do think you can accelerate the learning process significantly – I don’t think it’s unreasonable to suggest you can become very good at identifying all intervals in a year or two. It just requires some interest and diligence. At your music lessons (if you have them), you can always practice intervals with your teacher. If you want to practice daily at home, I suggest a website like Teoria. Even 5-10 minutes a day can make a HUGE difference. Start small, with just a few interval choices. Once they become second nature, add another interval. Remember to go in small steps – too many intervals when you’re not ready for them can be really overwhelming. Once you’ve got a lot of interval practice under your belt – maybe 3-6 months – it’s time to try some practical applications. Try imitating melodies (you can do this on Teoria). Better yet, figure out a pop song you really like entirely by ear. I did this a lot as a teenager. I’d go online and find the chords to give my left hand guidance. Then I would pluck out the melody notes by ear. This can take a long time if you’ve never done it before – expect to spend hours on your first attempt. It’s hard work, but deeply satisfying when you can play one of your favorite tunes without having looked at any sheet music. However, unless you’re starting with a naturally good ear, I wouldn’t do this right away. Build up your interval skills before you try to decode pop songs by ear – give yourself a chance of success. And if your first attempt doesn’t work, try again. Be dogged. This takes some people much more time to figure out than others. But the best way to learn is through trial and error, through personal experiments. Go out and do it, and you’ll learn it far better than reading about it, or watching videos about it. Finally, I want to give you a couple tips if you’re having a hard time telling intervals apart. Learn the pitches of a 5-finger scale. This means being able to hum or sing a 5-finger scale without error. An exercise like this is something that you would learn in choir or in a vocal class, and it’s very helpful. I don’t have much experience with teaching people to sing, but when people first learn to sing pentascales they often get stuck on the half step. Half steps are difficult to sing at first if you have no vocal training. The temptation is to accidentally make it a whole step, which messes up the sound of the scale. Unfortunately, if your ear isn’t very developed, you won’t notice if you’re doing this. But like anything, repetition is key. Play a pentascale on the piano and sing along with it a few times – most people can tell if they’re hitting the right pitch when they sing along with something. Eventually the sound of that half step will become burned into your mind. Just make sure you’re playing the scale in your vocal range – give yourself a chance of hitting the right notes! So now that you can sing a pentascale as easily as you can write your own name, here’s how I use it for interval training. Say this is the interval I need to identify – you can see I’m playing a 4th. I listen to the first pitch, and the second – and then I try to bridge the difference with a pentascale in my mind. I hum the tune in my head, and then realize that I can fit two tones in between the ones played – so I know it’s a 4th. And once you’ve got the hang of that and you start getting into wider intervals (6ths, 7ths, 8ths), memorize the sound of a full scale. Again, this is a process I developed on my own after many years of piano study. It’s extremely accurate for me, since my sense of pitch is very well-developed. In exams I’ve almost always received full marks or that part of the exam. If you take the time to develop your sense of pitch, I promise you’ll find it just as useful. Then there’s the second technique, which can work well – for a time, at least. This technique involves associating a song melody with each interval. For example, a 2nd is “Frere Jaques”. A 3rd can be the opening of “When the Saints Go Marching In”. A 4th is “Here Comes the Bride”. A 5th is “Twinkle, Twinkle”. I use this approach for students in their first years, but usually abandon it somewhere around the intermediate stage. It just becomes too cumbersome of a system, especially when these intervals need to be identified going up AND down, major AND minor, and so on. There’s just too much to remember. However, it’s a super useful first step, and I usually use it when teaching 2nds, 3rds, 4ths and 5ths for the first time. You might find it equally useful in your early learning stages. Ear training is a really useful thing to do – developing your ear is as important as developing your sight reading skills. Sometimes I find that students tend to neglect one at the expense of another, so I always recommend a balance of both.